MainAll NewsInside IsraelIsraeli bureaucracy holding up Jerusalem embassy move? Israeli bureaucracy holding up Jerusalem embassy move? Zoning regulations impeding planned May 14th US embassy move, could delay implementation of embassy transfer. 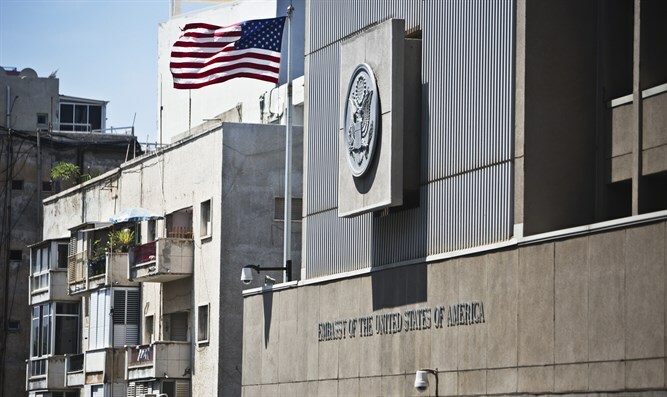 Officials in the US State Department and the Israeli government are concerned that Israeli bureaucracy and local zoning regulations could seriously delay the planned relocation of the American embassy from Tel Aviv to Jerusalem, Channel 2 reported Tuesday night. On Tuesday, however, Channel 2 reported that senior officials are concerned that Israeli red-tape may nix the May 14th unveiling. According to the report, State Department officials have requested permission to construct a roughly 10-foot wall around the new embassy building, as well as pave a new road to increase access to the facility. Director-General of Israel’s Foreign Ministry, Yuval Rotem, has warned Finance Minister Moshe Kahlon (Kulanu) that without special dispensation from the government to circumvent the normal bureaucratic channels, the embassy cannot be opened by May 14th. While the future embassy compound – currently the consulate compound – can be rezoned to permit the alterations, without a special waiver it will require approval by the National Planning and Building Committee. The committee is scheduled to meet next only in April, after the upcoming weeklong Passover festival.